Buying a handgun for the first time can be a daunting task. A lack of experience can lead to feelings of intimidation and the wide variety of brands, models and calibers available can make it even more confusing. But fear not shoppers, here are some tips to help you overcome any anxiety, sift through the noise and find the right handgun for you! People cite a few different reasons for owning a gun. Most often, though, they say self-defense or recreational shooting. If you commit yourself to a purpose, like say concealed carry, that helps narrow the selection. In that case, you might want something small that packs a punch. If you’re only thinking about recreation, you might consider something with a large frame and small caliber. But, if you’re not fully committed to a purpose, you’ll probably want something that lands in between the two. In any case, you’ll want something functional that you can comfortably handle. You want a “nine millimeter” that “takes 15 in the mag, one up the pipe” and has a ”wide ejection port, no feed jams” like Martin Riggs in Lethal Weapon? Interested in “the most powerful handgun in the world” like Dirty Harry carries? Or how about “a porcelain gun made in Germany” that “doesn’t show up on your airport X-ray machines” and “costs more than what you make in a month”? Grab the Glock 7 as seen in Die Hard 2. Going in with an idea of what you want is never a bad thing, but be practical and get educated. The Beretta 92 is a fine pistol, but full-size duty handguns have evolved since it was introduced 30 years ago. The Smith & Wesson 29 is a cool piece of hardware, but a tough one to start out with. And, nothing about the Glock 7 exists. Applying simple concepts goes a long way. The bigger the gun, as in longer and heavier, the easier it is to control whereas the smaller the gun, as in shorter and lighter, the harder it is to control. The same concepts go for caliber. So, find the healthy medium that works best for you. If you’ve never shot a handgun before, that first time will either be fun and exciting or kinda miserable. A lot of times that experience is wholly dependent on the handgun’s size and caliber. A full-size Glock chambered in 9mm, for instance, is pretty easy to shoot. A .357 Magnum derringer? Not so much. Fortunately, most shooting ranges have a wide selection of options available for rent and their sales staff will be more than eager to show you how to use them. During your range sessions, you can figure out your preferences. Revolver or pistol? Large or small frame? Striker or hammer fired? Manual or passive safety? But if spending a day renting guns and buying ammo isn’t in your budget, be strategic about it. At the end of the day, all handguns function the same way: point it, pull the trigger and it goes bang. So, limit the rentals to a few middle-of-the-road options — a compact 9mm pistol, for example, and a .38 snubbie — just to get a taste. Then, use your best judgment on where to go from there. You can get an idea of the functionality at the gun counter. After perusing the gun case, did you find yourself coveting that shiny little pistol, but it wasn’t available for rent? No worries. That’s what the internet is for. While Guns.com has thousands of gun reviews, there are no shortage of opinions elsewhere online. With that much information, you should be able to find everything great about the gun and everything wrong it within minutes. But there’s a caveat to that advice: reviews tend to be subjective. Some will say the handgun is perfect, most will say it’s average, and others will say it’s horrible. If you dig deep enough, you’ll find all three. So, put on your deerstalker cap and search for patterns. Maybe one review finds the pistol handling ok, another claims it doesn’t work with cheap ammo, and another reports it works best with premium ammo. While they all hold nuggets of truth, it takes all three to learn the full picture. Handgun prices can vary greatly depending on brand, caliber, size and construction. But market forces keep competitors in check. Say you’re in the market for a full-size polymer-framed pistol chambered in 9mm, you’ll be in luck because those are all common features and competition is a plenty. Considering options from major manufacturers Beretta, FN America, Glock, Sig Sauer and Smith & Wesson — which all competed to supply such a pistol to the U.S. Army — they’re all fighting for your business if you’re willing to spend around $615 (the average of all MSRPs). 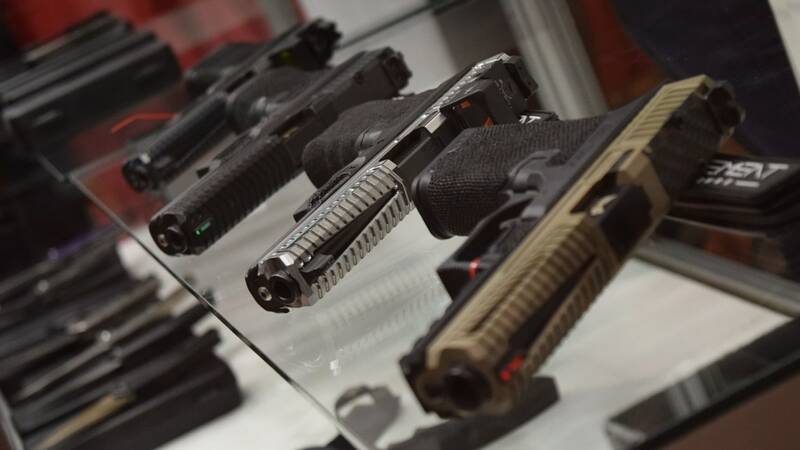 Those variables provide result in eight pistols: Beretta’s APX and Px4 Storm; FN America’s FN 509, FNS-9 and FNX-9; a Glock 17; a Sig P320 Nitron; and a Smith & Wesson M&P9. But play with the variables. Change full-size to compact, for example, and you’ll see the price drop by about $25. Replace 9mm with .40 S&W and see the selection drop to an average of $586. And, just for fun, change polymer to steel and see the selection drop to only two guns — by Sig and Smith & Wesson — and then the price increase to more than $1,100 (presumably, because production costs are higher and there’s lower demand for those options). In other words, competitors will try to match one another, especially for common and popular features, so if that’s what you’re going for, there’s a good chance you’ll have a lot of options within the same price range. But if you’re wanting something that falls outside the norm, you might have to pay more. Buying a handgun doesn’t have to be difficult and don’t let anyone tell you differently. Although there are lots of options out there, understanding the parameters and concepts goes a long way. Just go in with an idea of what you want and managed expectations. Then, if you want to splurge on that second gun, have at it. Happy shooting!